The ceiling is just another wall…. During the course of designing my home, I knew that I wanted to make sure that the ceilings were not ignored. So early on, I had the architect include a combination of vaults, trays, and coffered ceilings in all of the main rooms. Everywhere else, I made sure that the ceilings were raised to around 13 feet. Of course if your home is already built, changing the ceiling height is probably not an option. However, you can still have a designer ceiling. Here are some things that can be done to add some character to your ceilings. When the painters were beginning the job of painting my home, I provided them with a list of all the paint colors needed, as well as a labeled layout for the location of each color. However, I arrived on day 1 of painting to find a hesitant crew. It seemed as though that while they were very good at their job, they had not previously worked with a designer. So, the idea of anything other than a flat, white ceiling was a foreign concept to them. After some time of reassuring them that the paint instructions were indeed correct, they were off and running. A few things to keep in mind, when deciding on a paint color for a ceiling, 1) a light color is great when you want to keep an open spacious feel, and 2) a dark color can bring the ceiling down closer and create an intimate feel. I love the look of this dining room. The grey on grey tones give a nice modern look, and although the ceiling is quite dark, it draws your eyes to the details. If you want to go a step further, some architectural character can be added with beams and/or molding. It can be as elaborate or as simple as your tastes dictate and still be a nice feature. Cedar beams really add a rustic charm to any home. (This room was intended as a second living quarters, but I decided to use it as a pool house). 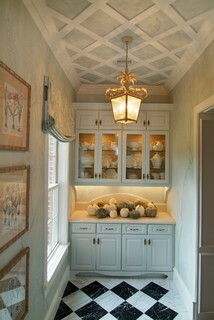 This room, designed by Carla Ashton, makes use of lattice to add a faux ceiling treatment. It’s a relatively inexpensive project which adds a lot of character. In what ways have you made a statement with your ceilings. Share your ideas with everyone by posting a comment! I love hearing from viewers. Rick, Congratulations on the remodel. I am sure that you are doing a great job!